In public health research, the focus has traditionally been on descriptive and analytic epidemiological research (“what”, “why”, “where,” and “who”). 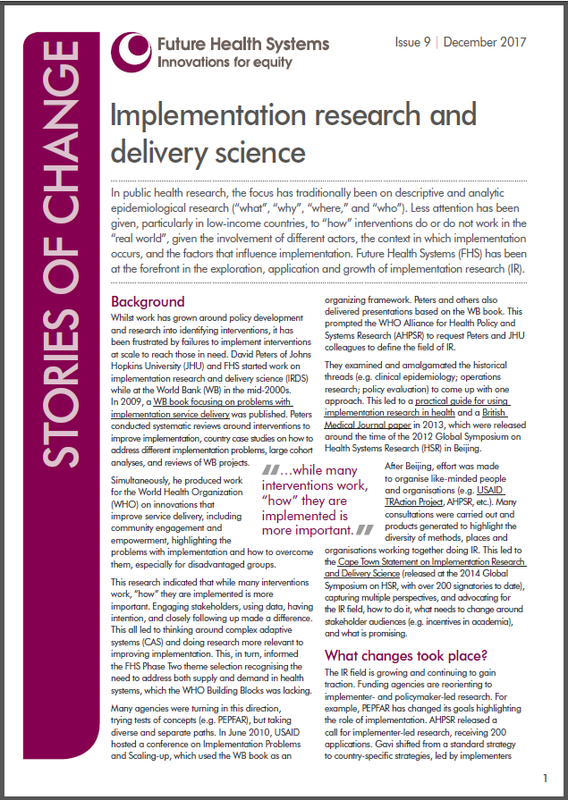 Less attention has been given, particularly in low-income countries, to “how” interventions do or do not work in the “real world”, given the involvement of different actors, the context in which implementation occurs, and the factors that influence implementation. Future Health Systems (FHS) has been at the forefront in the exploration, application and growth of implementation research (IR). The Ebola epidemic of 2014–2015 was one of the most significant public health threats of the 21st century, a crisis that challenged leadership in West Africa and around the world. Using the experience of Liberia's epidemic control efforts, we highlight the critical role that leadership played during four phases of the epidemic response: (1) crisis recognition and early mobilization; (2) the emergency phase; (3) the declining epidemic; and (4) the long tail. We examine how the decisions and actions taken in each phase of the epidemic address key crisis leadership tasks, including sense-making, decision making, meaning-making, crisis termination, and learning, and assess how leadership approaches evolved during the different epidemic phases to accomplish these tasks. In low-income countries, a growing proportion of the disease burden is attributable to non- communicable diseases (NCDs). There is little knowledge, however, of their impact on wealth, human capital, economic growth or household poverty. This article estimates the risk of being poor after an NCD death in the rural, low-income area of Matlab, Bangladesh. The objective of this study was to assess the association between health facility characteristics and other individual/household factors with a woman's likelihood of skilled birth attendance in north-central Afghanistan. The study finds that assumptions that women who give birth with a skilled attendant do so at the closest health facility may mask the importance of supply-side determinants of skilled birth attendance. More research based on actual utilization patterns, not assumed catchment areas, is needed to truly understand the factors influencing care-seeking decisions in both emergency and nonemergency situations and to adapt strategies to reduce preventable mortality and morbidity in Afghanistan. This paper examines common approaches for quantifying health inequities and assesses the extent to which they incorporate key theories necessary for explicating the definition of health inequity. The first theoretical analysis examined the distinction between inter-individual and inter-group health inequalities as measures of health inequities. The second analysis considered the notion of fairness in health inequalities from different philosophical perspectives. Despite progress in improving health outcomes in Afghanistan by contracting public health services through non-governmental organizations (NGOs), inequity in access persists between the poor and non-poor. This study examined the distributive effect of different contracting types on primary health services provision between the poor and non-poor in rural Afghanistan. In reviewing national health systems assessments (HSAs), the authors identify four primary rationales for doing HSAs: (i) to motivate health systems reform, (ii) to promote harmonization and alignment across actors in the health system, (iii) to help translate health systems reforms into meaningful ways to track performance, and (iv) to facilitate learning through cross-country comparisons. The authors propose a set of principles to guide HSAs. This paper presents a system dynamics computer simulation model to illustrate unintended consequences of apparently rational allocations to curative and preventive services.